Our review yields consistent themes that incarceration harms opportunities for marriage, increases the likelihood of marital/partner dissolution, and lessens the chances of father involvement. Women separated from their partners experience a host of daunting tasks, which may include single parenting; subsisting on a diminished income; facing social stigma, loneliness, and isolation; and dealing with the emotional turmoil of having a loved one incarcerated. Children may face similarly challenging ordeals, including feelings of abandonment, economic deprivation, changes in caregivers and residence, and increases in emotional problems. The reentry process is also marked by challenging family reintegration issues. The hardships of recreating life after prison and reestablishing family roles can strain emotional resources. Reconnecting with children after long separations is a difficult process. Yet, success in these endeavors has important implications for recidivism and family well-being. Our review of the literature suggests that access to family strengthening programs is often inconsistent and insufficient. However, promising approaches are emerging. Although sparse and sporadic, correctional facilities are beginning to offer marriage education classes, couples counseling, and furlough programs for partners to reconnect. Imprisoned men are slowly gaining access to parenting support, including group classes, group therapy, and increased and enhanced visitation. There approaches focus on essential relationship skills such as communication, emotional understanding, problem-solving, conflict resolution, and affection and intimacy. These programs aim to increase father involvement and parental efficacy by enhancing understanding of child development, discipline techniques, anger management, the importance of fatherhood, and co-parenting relationships. Although these programs have consistently been dogged by a lack of rigorous evaluation, preliminary evidence is accumulating that indicates the potential of these programs to improve partner and parenting relationships. Evaluations of marriage/partner interventions in prison suggest that they can be successful in increasing communication skills and relationship satisfaction and decreasing negative couple interactions, feelings of loneliness, and recidivism. Prison-based parenting programs have shown achievements in skill building and perceptions regarding the importance of involved fatherhood. Moreover, fathers involved in these parenting programs have reported increased contacts with children. Despite these successes, a number of barriers still exist that limit service provision and retention, including lack of partnerships between the criminal justice system and community-based organizations and difficulties in involving family members because of geographic distance and time constraints. The most striking finding of our literature review is the lack of rigorous research aimed at fully understanding and serving incarcerated fathers and their families. To summarize the issues faced by the women and children affected by men’s incarceration, we relied on a relatively small body of research. These sources mainly included small, qualitative research studies that involved interviews or focus groups with men who were in prison or were recently released and with their spouse/partner. These studies relied on nonrepresentative groups of individuals and, thus we cannot say with any certainty that the issues they face are generalizable to the diverse inmate population. Although these studies have been important for identifying issues likely faced by most inmates and their families, more research is imperative to investigate the processes through which imprisonment affects marriage, child adjustment, and community collective efficacy. Moreover, with a few notable exceptions, much of the research is not longitudinal. What is critically needed is research that follows individuals and their families throughout the period of criminal justice involvement to examine (1) how key points such as the arrest and trial, incarceration, and release affect families; (2) the mechanisms through which individuals and families deal with these stressors; and (3) the factors that are associated with successful coping and adaptation. The identification of theory-based and empirically derived risk and protective factors is key to the development of effective interventions. However, in order to disentangle the effects of incarceration from those of other risk factors that accompany it, including poverty, substance abuse, family violence, and racial discrimination, what is needed is longitudinal research that includes a comparison group of similar individuals and their families not involved in the criminal justice system. The literature available to support evidence-based approaches to family strengthening is also limited by the lack of rigorous evaluation methods. Those who do include evaluations often have small, nonrepresentative samples, single group pre- and post-test designs (i.e., no control or comparison groups), and brief follow-up periods that rely on data from a single reporter. Rigorous experimental or quasi-experimental evaluation efforts are needed to identify approaches that work best. The field will benefit greatly from the use of the strongest research designs to justify social policies and intervention services. To advance the research base, a stronger focus on cultural diversity is also necessary. Men of color are overrepresented in the criminal justice system, and communities of color pay a high price for incarceration including decreased family stability, limited father involvement in child-rearing and reduced family income. Research is needed that explores cultural roots, community contexts, and the diversity of family and kinship patterns and how they can be strengthened when a family member is imprisoned. Moreover, it is important to recognize that interventions and policies may work differently for individuals of varied cultural backgrounds; thus, research that examines how race/ethnicity moderates intervention effectiveness is critical. Finally, researchers and policy makers need to carefully scrutinize policy interventions to ensure that they are not leading to unanticipated negative consequences. For instance, services that promote marital commitment need to ensure that women and children are not unintentionally exposed to family violence and abuse in the attempt to reintegrate ex-offenders back into their nuclear family. Despite these limitations, research and practice in this area is moving forward. Evaluations of multi-site and community grant programs are currently underway which will shed light on best practices for the field. The national multi-site evaluation of recipients of the Marriage and Family Strengthening Grants for Incarcerated Fathers and Their Partners will yield critical information about the types of program, policies, and strategies that are most effective in enhancing healthy marriages and supporting responsible fatherhood. This large-scale evaluation and other smaller research efforts currently underway will help elucidate how successful programs work and for whom they work best. 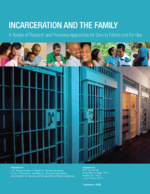 An important facet of this work will be to identify practices that facilitate coordination between human service and criminal justice agencies and suggest how institutional and organizational policies can smooth the way for future efforts to strengthen families facing parental incarceration. More evidence will help ensure that our social policies are having the intended outcomes of reducing recidivism and improving family functioning and child well-being.